The New Era Pinstripe Bowl matchup between the University of Notre Dame and Rutgers will be the only post-season college football game in which both programs each have a graduation rate of better than 85 percent, according to an annual survey. Notre Dame, with a 94 percent rate, and Rutgers, at 85 percent, will meet Dec. 28 (Saturday) at Yankee Stadium. None of the other 34 bowl games features both teams with such high graduation rates for football student-athletes. The survey of the academic programs among college football players was conducted by The Institute for Diversity and Ethics in Sports (TIDES) at the University of Central Florida. 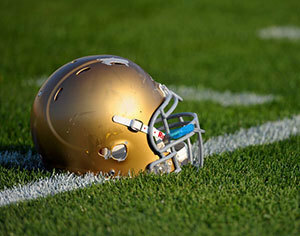 TIDES noted that the gap between the graduation rates for African-American and white football players remains a concern. Almost half of the bowl teams have a rate for African-American student-athletes at least 20 percent lower than for their white counterparts. At Notre Dame, however, the 97 percent graduation rate for African-Americans is actually 8 percentage points higher than for white players. Rutgers graduates 88 percent, making the Pinstripe Bowl the only bowl in which both programs have African-American graduation rates of better than 85 percent. In the latest NCAA report, Notre Dame posted a 99 percent graduation rate for all student-athletes, the highest in the nation — and the highest for a seventh consecutive year. A year ago, Notre Dame became the first university to concurrently rank No. 1 in the graduation rate of its football players and in the Bowl Championship Series standings. Originally published by Dennis Brown at news.nd.edu on December 10, 2013.